The Arabian leopard was probably never common, but it was once much more widespread than it is today. Arabian leopards are extinct in Syria, Jordan, Lebanon, and Egypt. United Arab Emirates: They are probably extinct in the United Arab Emirates although a report from Biosphere Expeditions which surveyed the Musandum Peninsula in 2006 and 2007 concluded that they were still present in the Omani portion of the peninsula. The report stated that this tiny population was unlikely to be viable in the long term. However, if this report is true then the leopard(s) certainly range across the border into the UAE. On September 15, 2007 a possible leopard track was photographed in Wadi Wurayah in the UAE, but so far no other recent evidence of leopard from this area has been reported. Kingdom of Saudi Arabia: A report published in the Journal of Arid Environments, No. 68 (2007), claimed that the author had seen an incredible 65 individual leopards at 42 sites in the Kingdom of Saudi Arabia but no proof (e.g. photographs, scats, tissue samples, etc.) was offered. The most recent confirmed evidence of Arabian leopards from Saudi Arabia consisted of two dead individuals poisoned at Al Namas in the spring of 2007. A comprehensive camera trap survey is currently being coordinated by the National Wildlife Research Center and the Saudi Wildlife Commission throughout the leopard's potential range in Saudi Arabia. Five teams armed with 50 cameras have yet to photograph a leopard so the continued existence of a wild population in the Kingdom is as yet unproven. Palestine/Israel: DNA analysis of leopard scats collected in the Negev Desert and Judean Highlands indicate that there are from six to eight Arabian leopards surviving there. Sultanate of Oman: By far the largest documented population of wild Arabian leopards exists in the Dhofar region of Oman where David Willis first succeeded in photographing several individuals with a camera trap of his own design in 1989. This lead to the development of the ongoing Arabian Leopard Survey which has succeeded in documenting about 30 individuals in the Jebel Samhan Nature Reserve and on Jebels Qara (Jebel Salalah) and Qammar. The total population of Dhofar is estimated to number around 50. Yemen: Yemen is presumed to be a "key range state" for the survival of Arabian leopards in the wild but the sitatution here is not entirely clear. 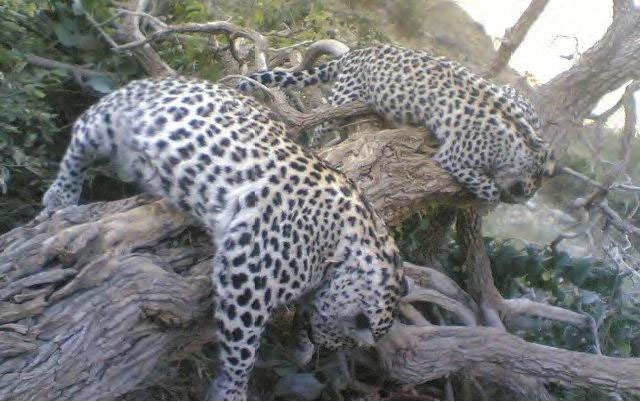 Scats collected in Hajjah in January 2009 tested positive for leopard DNA. Since then, the Foundation has engaged in a number of surveys in various parts of the country with some success. On January 11, 2011 a female Arabian leopard was photographed in the Hawf Protected Area on the border with Oman. Six and a half weeks later on February 24, a male was photographed in the same general vicinity. This is the first proof of continued leopard existence in Yemen and the most recent evidence from any country on the Peninsula outside of Oman.